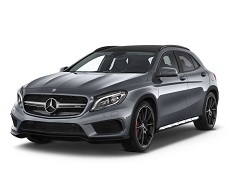 Correct Wheel Sizes, PCD, Offset, Rims and Tire specs for Mercedes-Benz GLA-Class series. I have a 2015 Mercedes GLA 250, tire 235/50R18, rim 7JX18ET46. I try to buy 17" winter tire 235/55R17, will rim 8jX17ET35 5x112 bore 66.5 M14 fit my Veh. Hi,Alen,The offset for these two rims are not compatible.For these two tires,they are compatible.